For the past few months I’ve been having problems with a couple of things while working at silversmithing on my workbench. Yes, I persisted longer than I should have. It got to a point where I wasn’t looking forward to working in my studio due to these difficulties. There had to be a fix. One of the problems was my old bench peg. I had bought a bench peg through a website on the internet and it looked fine so I thought it would do the job. The bench peg came with a clamp so you could attach it to the bench but unfortunately it didn’t secure it to the bench enough. The peg kept moving while I was using it and no matter how much I tightened the screw it would just keep moving. I found it was making my hands sore and I was even getting muscle cramps in my back and my neck. Well, sometimes you have to persevere with these things before you accept they just don’t work. The other problem was my soldering torch. While working on a piece I would sometimes have to lay it on the work bench. Oh, of course not still alight, Ha Ha!! But it was still hot enough that I had to be very careful. The other problem happened when I was finished for the day. I would have to turn the gas off and then let it just slowly burn out so that there was no gas left in the hose. I would sit there for quiet a while till it would burn out. This was becoming a real pain. So, Jeff and I looked at the bench and talked through what we needed to do to solve the problem with the bench peg. I suggested that I could buy another type of bench peg that was attached to a metal vice. 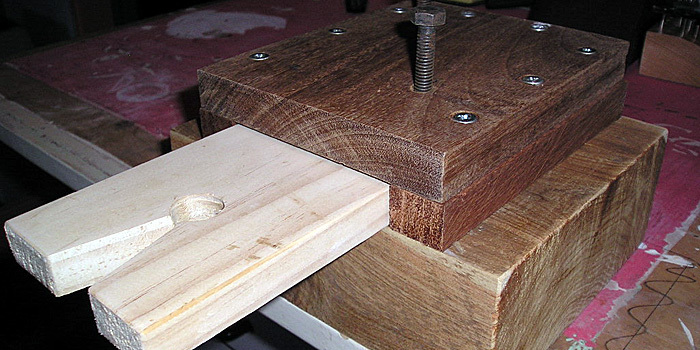 He suggested that he could build a bench peg and holder using some hard wood that he had lying around. Money always being an issue we went for making our own. 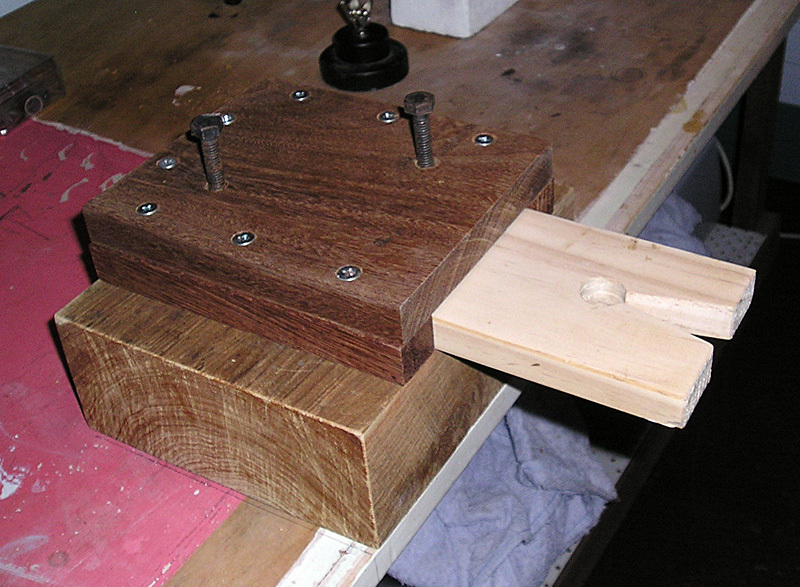 You can see in the photo how he made a holder for the peg using some very sturdy hardwood pieces he had. These were all cut and screwed together to make a very strong holder. The holder has a socket for the bench peg, designed to take standard 90mm pine. On the top are 2 bolts that screw down to hold the peg firmly in place. The bench peg itself was styled on my old one, but slightly bigger. The whole assembly was then firmly screwed to the bench top itself. Then there was the issue with the torch.We knew that it would need to a have a holder of some sort so that it would direct the flame up away from the bench and not set fire to anything. It also needed to be simple for me to hang and remove the torch. Jeff came up with the idea of using an old stainless steel metal shelf bracket. He took the support rod off the bracket to bend and make the holder for the torch. Unfortunately, he doesn’t have a metal vise so he had to use a wood vice to bend the bar into shape. That was a task. With perseverance he bent the rod to fit the bracket and bent the bracket so it could be screwed to the bench. 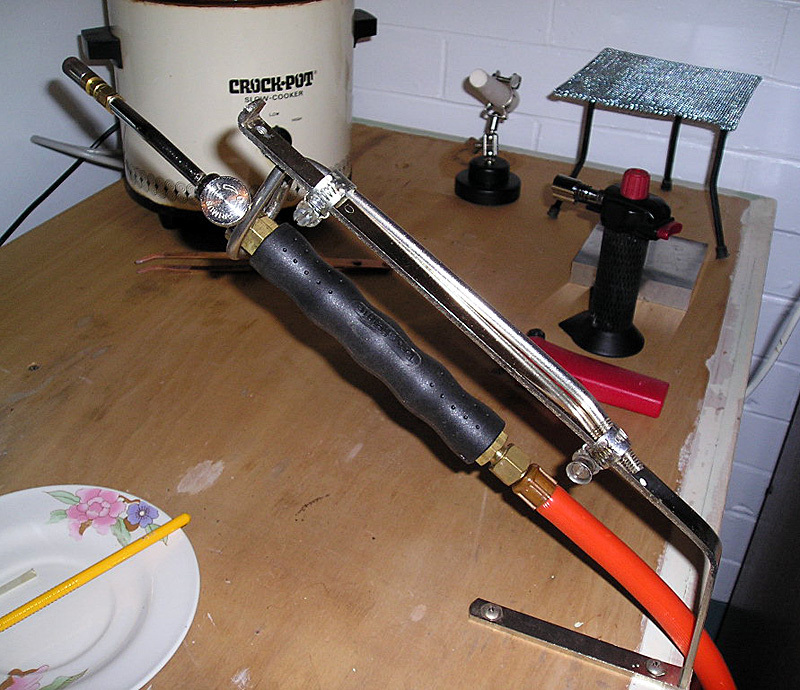 The rod was then attached to the bracket with a couple of hose clamps. I tried it all for the first time yesterday and what a difference. When I used the new bench peg for sawing sterling silver metal sheet it was like cutting butter. I couldn’t believe how well it worked. The torch holder, well, it was great not to sit there forever waiting for it to burn out. I could put it in the holder and go about cleaning up while it was burning out. 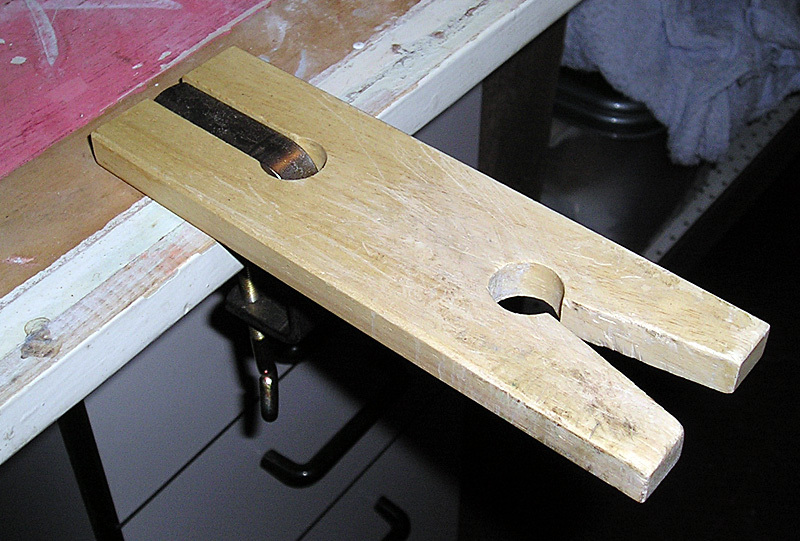 In summary, I have to say that the type of bench peg that is held to your bench by a simple clamp just isn’t a long-term solution. I strongly suggest you look to getting a much more sturdy option from the beginning or you may start getting disillusioned as I was. Your will also need a good bracket to hold your torch. There are times when it is easier to put the torch in the holder while lit for just a few seconds while you sort out the pieces you are working on.